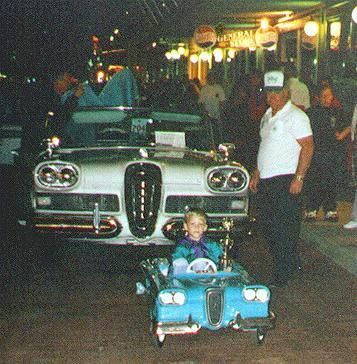 When edsel was introduced in 1958 it was brought out with lots of fan fare. The only problem was that it was brought out in a terrible year during a depression. car sales across the board were way down many makes struggled Studerbaker/ Packard took it's last gasp and Desoto saw the begining of the end that year. The critics were also less than kind in the press for the new model from the Ford Motor Company. Comments about it's "horse collar grille" and claims that is was merely parts from the other divisions put togother to make a new car line. Edsel continued through 1959 and 60 but sales were never near where they had hoped they would be. 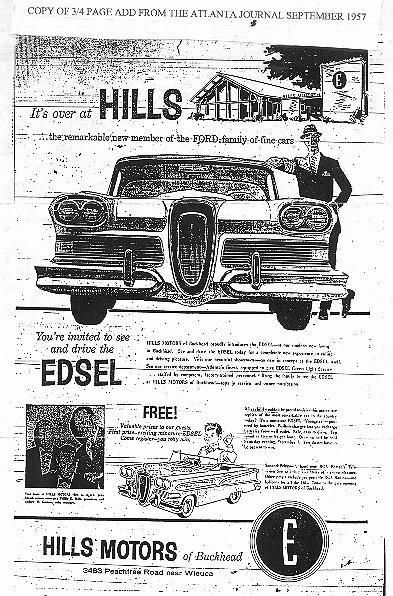 Ford motor company pulled out a lot of stops when it came to marketing the Edsel with lots of advertising and the mini Edsel made by Donaldson Manufacturing of north Kansas City, Kansas. the company made them for dealers to use in promotions parades and all kinds of advertising. 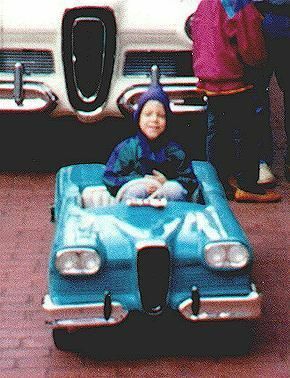 Many thanks to the lucky collector that actually owns the car pictured here THIS IS HIS SITE that has much more information on it about these rare little promotional cars. The information I have seen states that the body on these was fiberglass. the 57 Sunliner 500 made by Donalson had a styrene body. 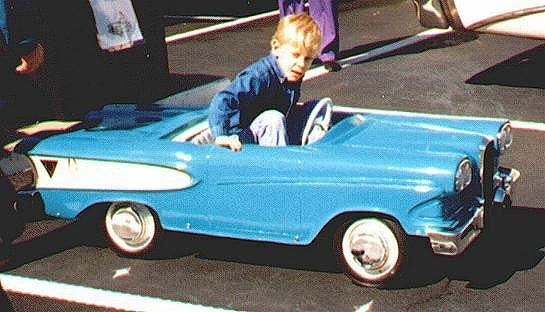 I wonder if they had the same problem as the 58 Desoto Firemite with the Styrene body. when they were exposed to cold weather and vibration or impact the body would break! I am sure there is a lot more to be learned about these cars and the manufacturer. 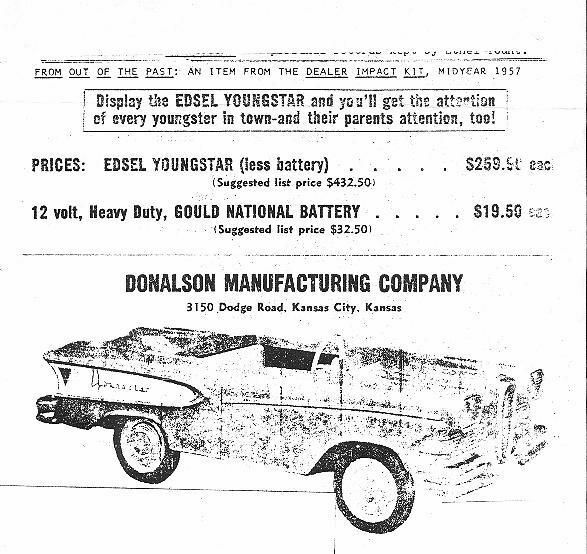 If anybody has any additional information or images of Edsel Youngstars I would love to share them with everyone on this site. The same company that made the Edsel youngstar also made a fairlane or Skyliner version in 1957 and 1958. As far as I know this is the only years for these two models but if anyone has any additional information I would love to see it.